Sharing your home with dogs ensures happiness, fun, and companionship. It could also mean your house looks a bit like a pet store at times, with toys, blankets, bones, and crates everywhere. While you must provide these things to make your furry family members comfortable and safe, the décor of your home can still be pleasing to you. 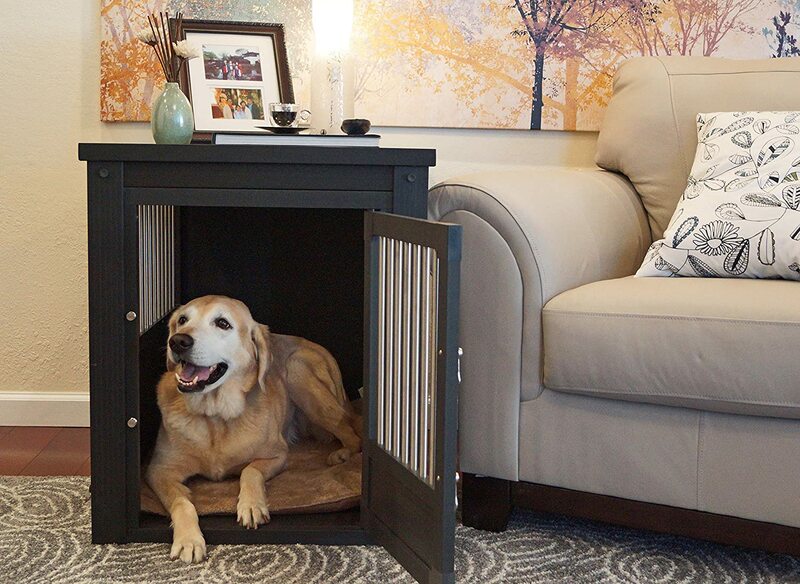 In this article, we review five dog crates that look like furniture to modernize and enhance the traditional wire and plastic versions. Gone are the days when dog parents were forced to throw a blanket over a plastic airline crate to hide it in the corner. These days, wicker, steel, wood, and molded fiberglass are used to create elegant and trendy designs to house your pup in style. These pieces become part of your everyday furniture. They also just happen to house your pet when you are away from home. This lovely solid wood and wicker resin crate will add a lovely accent to almost any home. The classic American Craftsman-styled dog home has a unique five-way door design. The door opens out, in, left, right, or removes completely for your convenience. This crate also sits on an elevated base with padded feet to protect your floors. The Rhino Wicker panels won’t absorb fluids or odors and clean with soap and water. Removable pan catches accidents and spills for easy clean up. Furniture-grade wood frame with Early American finish. Oil-rubbed bronze finish on door and side vents. Finger latches secure door at top and bottom. PROS: Reviews speak highly of the look of this crate. They like the fact that it resembles a nice piece of furniture in their home. The unique door also got high marks. Many people said they have left the door off entirely so their dog could come and go as she pleased. The ease of assembly was mentioned by many customers as another feature. Tools come with the crate for manual or electric assembly. CONS: Reviewers complained that the crate’s size was smaller than they thought it would be. The dimensions were stated clearly, but customers did not measure their dogs before purchasing. Also, some were unhappy that their puppy chewed the wicker resin. It is important to know your dog’s habits before buying this type of crate. 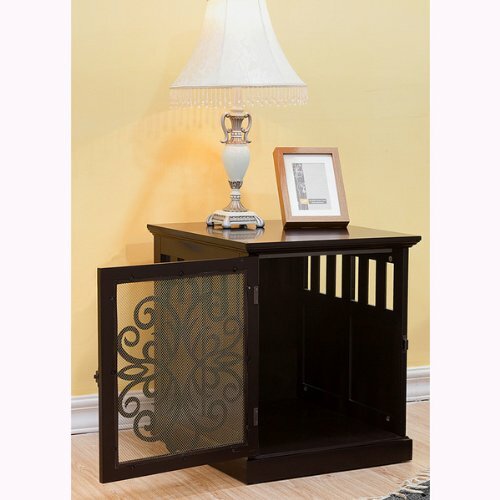 As an accent piece of furniture, this decorative wooden end table crate for dogs is beautifully crafted. It could be used in your den as a side table by a reading chair or in the bedroom as a night stand. The rich espresso brown color and elegant design on the door would complement most any home’s décor. It features mesh on the door to prevent your dog’s escape. The top, sides, and bottom are made from heavy wood. The back is heavy panel board. Includes machine washable pad with anti-slip backing. Not intended for puppies or destructive dogs. PROS: Reviewers love the look of this stylish crate in their home. They mention how easily it fits in with their existing home décor. Customers also have commented on the ease of assembly and how sturdy this piece is. Many say their dogs are happy to use the crate for naps even when not required to do so. CONS: A couple of reviews mentioned their dogs chewed through the crate and escaped. One of these was a dog with separation anxiety. Before confining a destructive dog in a crate of this type, be sure to consider better options. This style of crate is not meant to be used for chewers. The innovative design of this pet crate and gate unit from Merry Products is perfect for pet parents living in small spaces. When needed, it can contain your dog in a traditional crate with a door that locks. Put the removable top on and use it for an end table or night stand. For times when your dog is free to explore some, but not all, areas of your home, use this 2-in-1 Pet Crate and Gate to close off-limits areas to your dog. Constructed of wood veneer with medium brown satin finish, this unit is a lovely addition to any home. Very versatile. 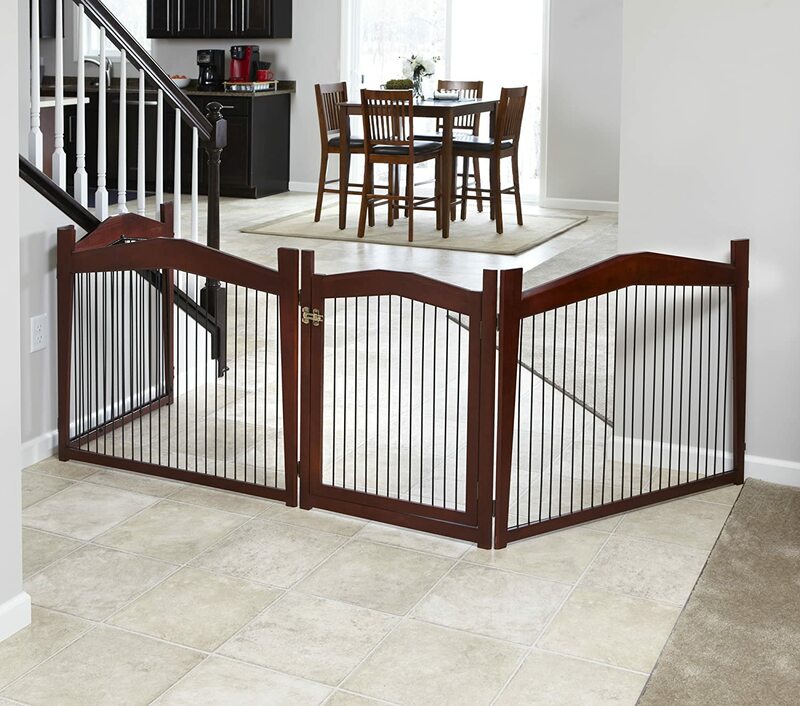 Use as dog crate or pet gate. Includes separate plastic bottom tray to contain spills. Each gate panel is removable to ensure custom fit for any opening. PROS: The versatility of this pet crate and gate combination got high marks with reviewers. The ease of removing the top from the unit to change it into a gate configuration was really popular. Many people remarked about how stylish the crate/gate was with their existing home furnishings. The color of the wood complements many interiors. 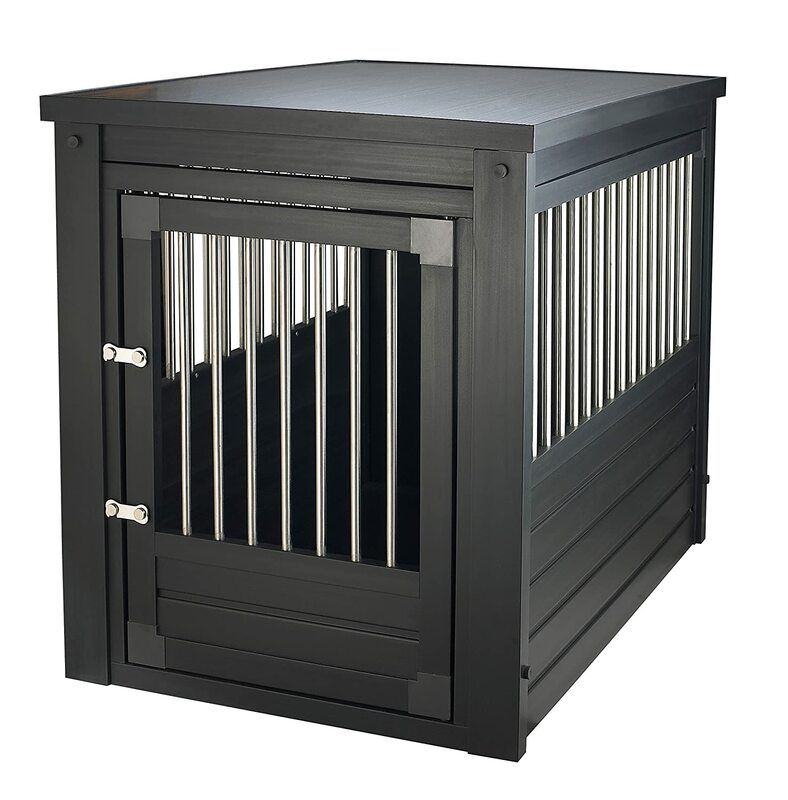 Customers think this crate furniture is most suited for dogs past the puppy chewing stage. CONS: A few customers were disappointed the plastic tray was not attached to the crate. With this innovative design, that seems to be impossible. Regarding the dimensions of the crate, a couple of customers complained that the measurements were given for the outside of the piece, not inside where the dog is kept. However, this is standard practice with all dog crate measurements. 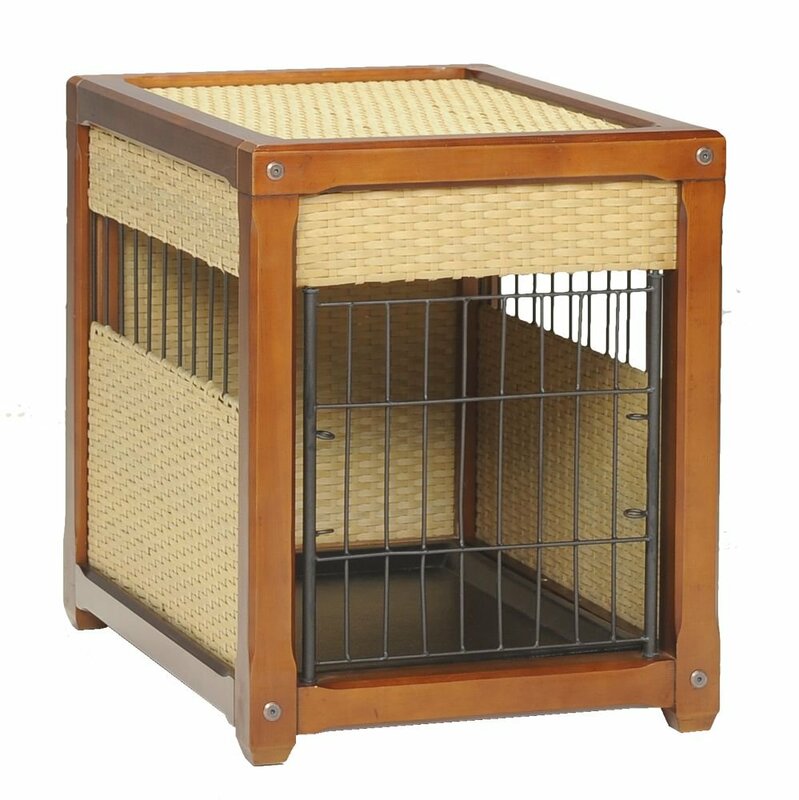 This attractive and sturdy pet crate doubles as a stylish end table for your home. It is made of maintenance-free, non-toxic ecoFlex; a material blended of wood fibers and recycled polymers. It will not warp, absorb moisture, crack, or split. The ecoFlex Pet Crate/End Table comes in four sizes and three colors, making the fit and color customizable for your dog and home. A very generous 10-year manufacturer’s warranty ensures quality craftsmanship. Stainless steel bars on door and sides. Door swings in and out. PROS: The reviews of this crate’s composite material are very positive. People love how easily it cleans. The floor can be removed if necessary to sanitize after an accident and the door can easily be removed, too. Reviewers have said that the crate is so sturdy that it is able to support a TV sitting on it. On the other hand, the eco-friendly material makes it lightweight. Assembling the piece was easy with no tools necessary. CONS: Assembly instructions were not clearly marked as being for all four sizes of the product. Once the reviewer figured out her mistake, it was easy to assemble. One customer noted that the bottom of the unit is elevated and it made a noise when her dog walked on it, which scared the dog. She had not placed a bed or pad on the floor of the crate to absorb noise or provide comfort for her dog. People have complained about dogs breaking out of this crate. Again, this is not a product to use for dogs who are just learning crate training. For dog people who wish to furnish their home with a more modern style, the DenHaus ZenHaus Indoor Dog House and End Table is for you. This stylish unit is handmade by artisans in the United States from fiberglass and has an opaque, shatterproof glass top. This crate is available in several colors to fit any décor. It also features a removable door for the in-and-out dog. 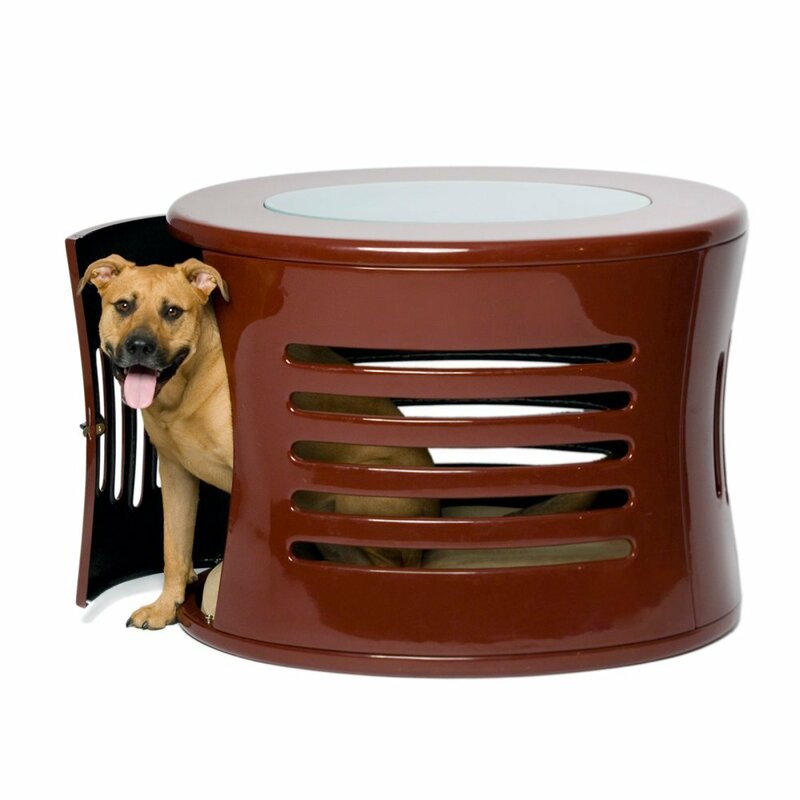 There are vents all the way around and provides a 360-degree view for your dog while inside. This piece is so unique it is patent protected. Available in two sizes and four colors. Sleek and smooth design hugs your pet. Made in the U.S. since 2005. Floor cushion available (sold separately). PROS: Reviewers who purchased the ZenHaus dog crate remarked about the durability of the product. In addition to being sturdy, the fiberglass construction material made the crate very lightweight. It was easy to assemble for most customers, also. DenHaus customer service got high marks for their help with questions. CONS: There were few criticisms of this dog crate. Mostly, customers received products that had been damaged in shipping and the company was happy to replace the damaged merchandise. 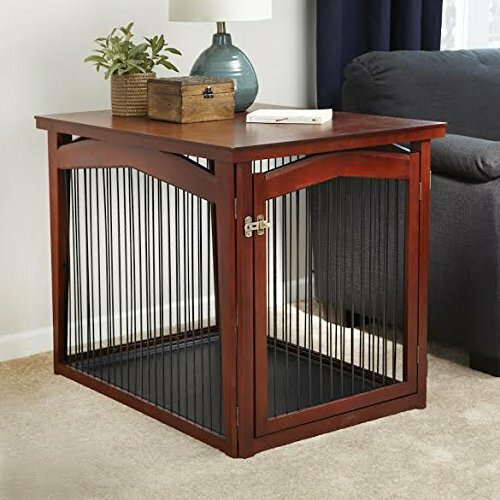 In addition to the dog crate furniture products we have reviewed in this arti cle, we are including an additional unique pet furniture piece. The Coffee Table Pet Bed from Sauder is made from birch veneer wood in a dark espresso finish in the popular Mission style. It comes with a full-length memory foam cushion with fabric cover. Both the cushion and removable cover are machine washable. Your dog will love being with her family while lounging in her bed and you will enjoy not having an unsightly dog bed in the corner of your family room. Keep your remotes, magazines, and glasses on top.